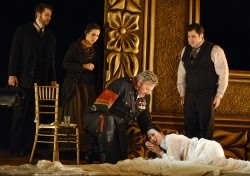 The Cast of "La Traviata"
Boston Lyric Opera got its season off to a welcome start with its production of Giuseppe Verdi’s “La Traviata”, not seen at BLO in the past decade. Based on a play which was in turn based on the novel “Our Lady of the Camellias” by Alexandre Dumas fils, with a libretto by Francesco Maria Piave, the opera is one of the most popular in the canon, and deservedly so. Though it failed miserably at its premiere, it gained popularity after some serious revisions by the composer himself. Verdi’s music for this work remains approachable to novices and is beloved by opera buffs. The story is an absorbing one, as a translation of the title would reveal, “A Woman Gone Astray”. Astray indeed; it often seems as though divas suffer from recurrent monetary insecurity, only relieved by a mid-plot dalliance or two with rich baritones, somehow leading to a late night return to the arms of a forgiving tenor. This may be attributed to the inflammation of the diva’s bank account (sometimes referred to as “diva-ticulitis”), or a worsening of a terminal illness culminating in a gloriously composed, and often quite lengthy, apotheosis of sorts as the diva and her stage character attain the heights of musical immortality. As such, putting aside nagging moral or ethical thoughts, it can be great fun for the audience anxious to see a loving reunion before the work finally ends. And so it was in this performance. Nanoseconds after the curtain raised, there was our heroine already coughing, a sure sign of dire things to come, but a few hours later, reconciliation there was, though at great cost as it almost always must be in operatic conventions. In this production, Soprano Anya Matanovic, in her BLO debut, starred as Violetta, one of those operatic courtesans with a heart of gold, who gambles everything for a chance at true love. Tenor Michael Wade Lee (also in his BLO debut) portrayed Alfredo, her ardent lover who first loses but ultimately gains his Violetta in that justly famed reconciliation scene. Both began a bit tentatively but eventually slipped comfortably into their roles. Matanovic particularly shined with her vulnerability and honesty in her death scene. Alfredo’s father Germont, intent on preserving the honor of his family at all costs, was played by baritone Weston Hurt, recently heard at Boston Odyssey Opera’s concert of Korngold’s “Die todt Stadt”; he was the vocal hit of the performance with his commanding singing. Also featured were members and alumni of the BLO’s estimable Emerging Artists program, including Jon Jurgens (Gastone), Chelsea Basler (Flora), David Wadden (D‘Obigny), Rachel Hauge (Annina), Omar Najmi (Giuseppe), and David Cushing (Doctor). David Kravitz was the Baron. The performance was conducted by Arthur Fagen (mostly competent, if the pacing was more than slightly lugubrious in the scene between Alfredo and his father) and Directed by Chas Rader-Shieber. The Boston Lyric Opera Orchestra and Chorus gave some depth to the familiar score. Technical credits included effective Lighting Design by Mike Inwood, and Wigs and Makeup Design by Jason Allen. The most controversial technical element was the Set Design by Julia Noulin-Mérat, minimalist to a fault in the first half of the production (except for the edge of what was such a mammoth painting that Violetta must have been inhabiting an airplane hanger). After intermission the scene at Flora’s party was truly bizarre, seemingly aping 1930’s Berlin decadence with its distractingly gross debauchery. The Costume Design by Jacob A. Climer for this scene (straight out of “Cabaret”) and Violetta’s demise (oddly sporting a train that must have been over twenty-five feet long) added to the strangeness of the proceedings. But “Traviata” is all about the music, and in the end that’s where the BLO truly delivered. It was a worthy start to what looks like a very promising season. Next up for the BLO is a far less familiar yet enticing production of Frank Martin’s “The Love Potion”, opening on November 19th.